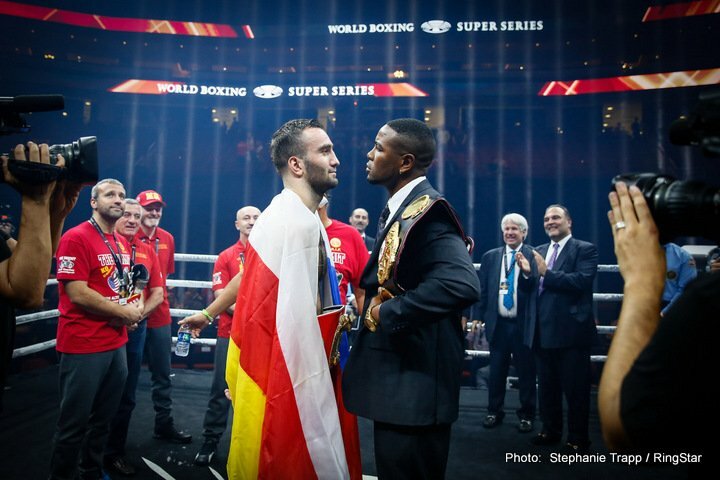 By Jim Dower: WBA World cruiserweight champion Yunier Dorticos (22-0, 21 KOs) has revealed that his semifinals fight in the World Super Series against IBF champion Murat Gassiev (25-0, 18 KOs) will be taking place on February 3 in Russia. What this means is Dorticos, 31, will be giving the home country advantage to the 24-year-old Gassiev on February 3. Gassiev is originally from Russia, but he now lives in beautiful Big Bar, California, where he trains with Abel Sanchez and alongside unbeaten middleweight champion Gennady ‘GGG’ Golovkin. This is going to be a great fight between Dorticos and Gassiev for the semifinals of the World Boxing Super Series. In the other semifinals fight in the WBSS tournament, WBO cruiserweight champion Oleksandr Usyk will be facing WBC champ Mairis Briedis in early next year. The winner of that fight will meet up with the Gassiev vs. Dorticos winner in the finals of the WBSS. At the end of the tournament, there will be 1 unified champion in the cruiserweight division. Dorticos looked very good in stopping KO artist Dmitry Kudryashov in the 2nd round in their quarterfinals fight in the World Boxing Super Series on September 23 at the Alamodome in San Antonio, Texas. That fight ended suddenly in the 2nd round after Dorticos caught Kudryashov with the perfect shot that put him down. However, that wasn’t the first time that Kudryashov had been knocked out early as a pro. In 2015, Olanrewaju Durodola knocked out Kudryashov in the 2nd round after hitting him with a flurry of punches. Gassiev knocked out the experienced former two-time cruiserweight champion Krzysztof Wlodarczyk in 3 rounds their fight on October 21. Gassiev landed a hard body shot that put Wlodarczyk on the canvas in round 3. That fight was over at that put. Gassiev, 34, is 7 years younger than Dorticos, and he’s looking very strong. Dorticos has the advantage in boxing experience from his amateur days in Cuba, but the two of them have had almost the same amount of fights as a pro. The winner of the Doricos vs. Gassiev fight could come down to which of them lands the first telling blow. If Gassiev can take Dorticos’ power, then he’s probably going to get to him sooner or later and knock him out with a single shot. Denis Lebedev was able to take Gassiev’s big power shots last year in December, but he still wound up losing the fight. Gassiev knocked Lebedev down with a body shot in the 5th round. But instead of continuing to target the body, Gassiev threw mostly head shots for the remainder of the fight, and Lebedev was able to go the distance. Gassiev would be better off if he threw more body shots, as he’s dangerous when he goes to the body.